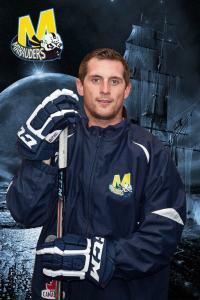 The St. Thomas Tommies have their first recruit for the 2012-2013 season adding 6'1" defenceman Jordan Thomas of the MHL's Metro Marauders. Known for his "stay at home" defensive style, Jordan had 34 points this past season as Captain of Metro. Coach Ryan was familiar with Thomas and told sportstream.ca today in an interview, "Jordan's a player I know very well. He has an old school mentality that makes him special. Nothing bothers him and he competes hard, that's a novelty in today's game. When you find a player who competes like him you scoop him up." Thomas also won the "MHL Character Award" this year. From theMHL.ca "an award designed to highlight a player every team hates to play against, but would love to have in their lineup, went this season to Defenseman Jordan Thomas of the Metro Marauders. Thomas, Captain of his team, earned 34 points in 52 games this season and, according to Head Coach Stan Hennigar is one of the toughest individuals he has ever coached. “Jordan Thomas is without a doubt one of the toughest players I’ve ever been associated with as both a coach and player”, explains Hennigar. “He has an outstanding work ethic in practices and games and hopefully will get a chance to move on to the University ranks. His battle level is beyond description and I’ve seen him play through illness and injuries that would have kept most players out of the lineup. It’s been an honour for our coaching staff to be associated with this great young man”. “It’s been a pleasure getting to know Jordon over the last two years and he is well deserving of this honor”, added Marauders GM Julie Marston. “He is a kid who is not only one of the hardest working players in the league, but he is an exemplary leader that has earned him the respect of his teammates, coaches and all members of the Marauders organization. He is a great kid with a big heart that loves all aspects of the game”.